Info "Every time I pick up a broom, I have to try this. It's a sickness. If you move too much, it falls; too little, and it gets away from you. Ugh... I gotta get out more." Broom Shtick is one of Young Cricket’s Microgames in WarioWare: Smooth Moves. The name is a pun on the word "broom stick". Like Balancing Act from WarioWare, Inc.: Mega Microgame$! and WarioWare: Twisted! and On a Roll from WarioWare: Twisted!, it involves the player balancing an item for a few seconds. 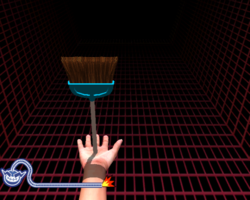 The player must balance a broom stick on the palm of the hand. The Wii Remote must be tilted accordingly to prevent it from falling. 1st level difficulty: The broom is short and blue. 2nd level difficulty: The broom is longer and pink. 3rd level difficulty: The broom is long, is yellow, and is hard to balance. This page was last edited on February 19, 2018, at 18:48.